Summary: Helena Wayne has had an exhausting couple of weeks and decides to go on holiday in California. Rather than take an aeroplane to arrive at her destination in a shorter timeframe, Helena decides that a trip from coast to coast should happen slowly and more leisurely. En route, Helena reunites with an old friend from college who also happens to be travelling to the west coast to finalise the procurement of an ancient Japanese statue. It turns out Helena’s friend isn’t the only person on the train interested in procuring the Japanese relic. Someone else aboard that same train wants it as well, leading to a mysterious murder inside one of the train’s compartments! Review: This is admittedly one of my favourite Huntress stories from the Joey Cavalieri era, but it is also a story that makes me very sad to read as well. This marks the second to last Helena Wayne Huntress story before Crisis on Infinite Earths unceremoniously writes her out of continuity despite being immensely popular with fans. The story reads a bit like an Agatha Christie style mystery, and given Joey Cavalieri’s affinity for classic literature, I wouldn’t be surprised if she served as inspiration for this story. This is also one of the few stories where the Huntress takes a backseat to Helena Wayne, which is admittedly refreshing as it affords Helena more opportunities to showcase her investigative skills out of costume. We are introduced to both a new character and a new villain for this story. We first meet a young woman named Myra Liebe, who also happens to be Helena’s friend in from college. 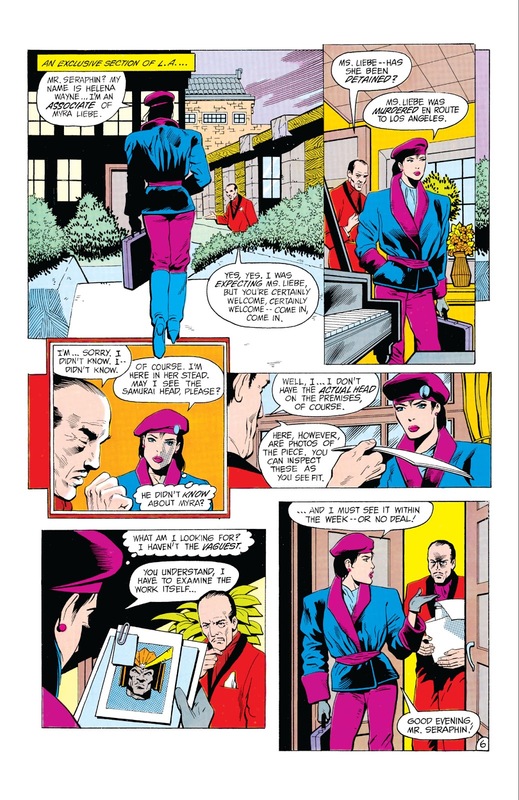 In contrast with the more stoic and reserved Helena Wayne, Myra is depicted as having a more outgoing personality, an optimistic attitude, and is very much a people person, which factors into her decision to take a train as opposed to an aeroplane. A decision that is markedly different from Helena’s who cited a desire for leisure and slow pacing. The juxtaposition between Myra and Helena is quite fascinating to observe, namely because of how their interaction draws out other aspects of Helena’s character that would otherwise not surface without her present. The reader learns on the opening page that Helena wants to be left alone and demonstrates a lack of desire or interest in socialising. When Myra invites Helena to a party taking place in another car, Helena reluctantly accepts the invitation to please Myra, but continues avoid interacting with the other passengers as much as possible. These stark differences between Myra and Helena are even captured in the character designs for both by artist Mark Beachum. Myra is depicted with stylish blonde hair and is usually seen wearing vibrant coloured clothing. Her body language is even depicted as expressive and is always seen smiling, effectively capturing her exuberance. Even Myra’s last name of Liebe (the German word for “love”) helps drive home the kind of personality she has. Helena by contrast is depicted as nearly the polar opposite of Myra. Helena smiles less, and despite wearing vibrant colours herself, also presents herself in a way that prevents her from standing out in a crowd. Her body language continues to be reserved and is even seen leaving the party harbouring a “I came, I saw, time to head back to my personal space” mentality. The more interesting aspect of this story takes place near the end when Helena unwittingly stumbles upon a murder in progress and is seen confronting the killer in her civilian identity. The reader witnesses for the first time how Helena handles a criminal situation without either her Huntress costume or weapons at her disposal. She puts up a fight but also avoids doing too much to avoid suspicion. 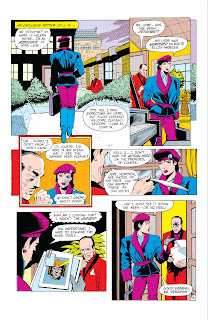 The victim is revealed to be none other than Myra herself, which sends Helena on a path to investigate her death, not as the Huntress, but as Helena Wayne. Since Helena is also a witness to her death, this also puts her on the path to encounter the Myra’s murderer again, who identifies herself as the Nightingale, a skilled assassin. On the whole this is a good Agatha Christie-style setup for what promises to be a wild ride for Helena Wayne without the Huntress. How much of an investigator can she be without revealing too much? How much of a skilled fighter can she be without arousing questions of how “ordinary Helena Wayne” even possesses the skills to fend off and even take down a skilled assassin? These are all the questions that het addressed in the next chapter. I will forever loath Marv Wolfman for being the one super villain who Helena Wayne could not defeat and who ended up killing her. Nightingale is like a pre-Crisis male version of Sonia Sato aka Judomaster. Wish we would have seen more of this ninja as Huntress benefited from physical and psychological threats that combined the two aspects into one rogue effectively.